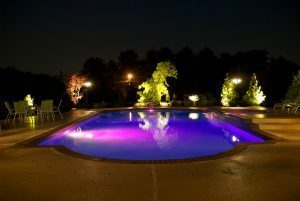 LED lights can really set the mood and make your pool stand out at night time. It is now a pretty common thing to see a pool in someone’s back yard. It is becoming something that doesn’t make your yard as unique as it used to. Now that you finally have your pool, you want to make it your own with a nice pool feature or two. Here are five pool features that you can use to really make your pool and backyard stand out against the rest. This is a beautiful addition to your pool and adds so much visual appeal to it. The sound of the waterfall is also very relaxing and will remind you and your guests of being out in nature. You can install it with a natural landscape to give it an even more realistic feel. A pool waterfall also adds an extra source of filtration to your pool and deters algae, so this pool feature has more benefits than just looks. You have so many options when it comes to lighting up your pool. Whether you want normal lights or ones that change colors, you can really make your pool stand out at night time with some nice lighting. This pool feature allows you to set the mood however you want and illuminate architectural elements that may have otherwise been overlooked. A great benefit of adding lighting is that you can now safely swim in your pool at night time. If you don’t want to install an intricate lighting design, you could invest in some floating pool lights that will surely set a great ambiance in and around your pool. You probably have seating around the pool, but have you ever thought about seating inside of it? You could install anything from a simple underwater bench to an entire lounge area on your water’s surface. This allows you the opportunity to take a break from swimming without having to get out of the water. For those who just want to sit on the water and don’t want to be submerged, a lounge chair on the water’s surface can provide the coolness of the water without having to get wet. If you are really feeling bold, a slide is a great and fun pool feature that will really make it stand out. There are a variety of different types, from ones that are better suited for young children to slides that will really induce a thrill. No matter what you are looking for, slides are great for adults and children alike. It adds an exciting element to your pool and gives people something to do other than just swim around. The choice between jumping in the pool or relaxing in the hot tub is a tough one, but it’s great to even be able to ponder such a decision. What better way to make your pool stand out than to add a hot tub next to it? Now, your guests have an option rather than being forced to get in the cold water. Swimming is indeed a work out and relaxing in the hot tub is a great way to soothe those muscles. This can also provide a separate area for adults to hang out while the kids are playing in the pool. Whether you want to upgrade your swimming pool or get a new beautifully-installed pool in your yard, Paradise Pools can complete the job. We have the expertise to walk you through every step of the process and ensure that you end up with a pool you can’t wait to take a dip in. Ready to get started designing the perfect pool for your home? Trust us with the job and be swimming in no time! For more information, contact us online or give us a call at (301) 725-0005. To get more fun pool design ideas, follow us on Facebook, Twitter, Pinterest, Google+, and Houzz. This entry was posted on Thursday, February 15th, 2018 at 2:07 pm. Both comments and pings are currently closed.